Naas, (Nás na Ríogh), for centuries the meeting place of the Kings of Leinster. 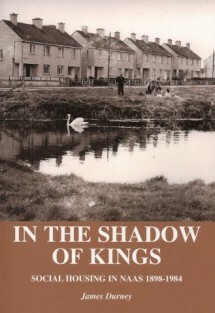 At the dawn of the twentieth century many Naas inhabitants lived in the shadow of these great kings. For them there were no castles, no whiff of royalty. Many Naas families lived in privately-owned, poorly built, single storey cottages, with no running water or toilets. In 1900 Naas was a small market town with a growing population of nearly 4,000, but hardly any residents owned that basic commodity – a house to live and rear a family. In 1899, despite great opposition. Naas Town Commission built its first scheme of social housing on the Newbridge Road. In the succeeding years, through the turbulent days of the new Irish state to the modern 1980s, Naas Urban District Council, did its utmost to improve the living standards of the people of Naas and rid the town, once and for all, of its teeming side streets and substandard housing. From Artizans Cottages in 1899 to St Corbans, Pacelli and Sarto Roads, to Lacken View and Fr Murphy Place in 1984 this book traces the roots of old Naas families. Sheridans, Burkes, Fennesseys, Higgins, and Kings are all here, in this lively tale of their long march from the crumbling cottages of Back Lane, Loughwee and New Row to the properly planned and pristine new schemes of St Conleth’s and Our Lady’s.